“THE meddling priest” is a description that still sits well with Jesuit priest, law professor and Queenslander Fr Frank Brennan. In his first week as chief executive officer of Catholic Social Services Australia, Fr Brennan said he had a clear plan for change. “We are living in a society where the gap between rich and poor is becoming wider, and I thought, well, something has to be done about that,” Fr Brennan, who has spent many years dedicated to the enhancement of Aboriginal rights and the rights and entitlements of refugees and asylum seekers, said. It was Fr Brennan’s 1998 involvement in the Wik Aboriginal debate that promoted former Prime Minister Paul Keating to describe him as “the meddling priest”. Now, Fr Brennan sees his five-year appointment as chief executive officer as just as important in advocating for social justice. He hopes the job will take him from the corridors of power in Canberra to towns and regional communities across the country. “I intend to use my expertise and the lived experience of the tens of thousands of people who rely on services provided by the national network of Catholic social services to help our federal politicians and bureaucrats to devise policies that assist those most in need,” he said. 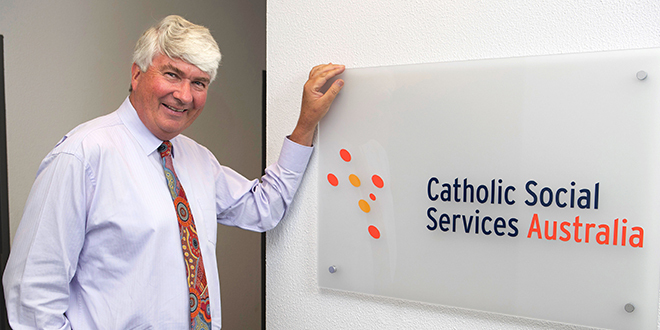 Catholic Social Service Australia is an umbrella body for more than 10,600 staff across 56 organisations, delivering services from 650 sites across the country, and directly assisting 450,000 people a year. CSSA also represents 6000 volunteers. In taking the reigns, Fr Brennan said the organisation required a greater participation by people, a greater sense of solidarity with “those we serve”, and a greater “joy in terms of proclamation of the Gospel”. “People are mistrustful of major political parties at the moment, and I thought one of the strengths of the Church tradition is that we’ve got Catholic social teaching which would insist that any proposed policy should meet three tests: equitable, sustainable (in the spirit of Laudato Si’), and truly respectful of the dignity of the poor,” he said. “These are very hard times for the Catholic Church in Australia, particularly with the devastating revelations of the Royal Commission, but at the same time we have a wonderful Pope Francis, who has called us back to our roots in terms of the Gospel being a message of mercy and joy. “And I thought what can we do in order to have the Australian Church take on a bit more of what I would call ‘the Francis effect’, where we can be out, not only proclaiming, but through our actions doing this. Fr Brennan intends to travel widely to hear concerns and look for solutions. In Queensland, he’ll soon visit Townsville after a request for him to meet local organisations and Church personnel. He also has a trip scheduled to Palm Island. “I want to get out there particularly to remoter parts of Australia. I want to be there meeting and encouraging our staff no matter how remote their location, meeting people they serve,” he said. Fr Brennan, who first studied at Downlands College in Toowoomba, and at the University of Queensland, has had long involvement with Aboriginal issues. In 1975 he worked in the inner Sydney parish of Redfern with priest activist Fr Ted Kennedy, where he also met and worked with Mum (Shirl) Smith, among others who were founding indigenous Australian legal, health and political initiatives. For the past eight years Fr Brennan has lived in Canberra, working as professor of law in the Public Policy Institute at the Australian Catholic University. He said he “helps out” in one of the city’s busiest parishes each weekend “and will continue to do that”. He is also on the city’s prisoner roster as a chaplain and finds the work “a privilege”. “It’s there that you find young men wrestling with the big questions of their lives, and often celebration of the Eucharist can be a still point in what is a desolate existence otherwise,” he said.